A 3D printer and number of 3D printing models can turn your ideas into real-life products. 3D printing technology is emerging rapidly and many designers and engineers are seeing the new technology as a revolution that can reform how future industries will look like. The cost of 3D printers and printing materials are agreed to be part of the problems that face taking this technology while entering into commercial production. However, many affordable 3D printers have been presented in the last few years by different manufacturers. Additionally, Kickstarter 3D printers and scanners have been presented by young inventors to solve the cost and material problems. Meanwhile, many users who seek to use 3D printing technology to visualize their ideas do not have previous software modeling experience or basic modeling skills. 3D scanners can overcome this problem, but it is still expensive for many users. While it is always recommended to learn the tools that help you model your own products, there are many websites which provide free 3d printing models that you can easily download, customize and send to your 3D printer. 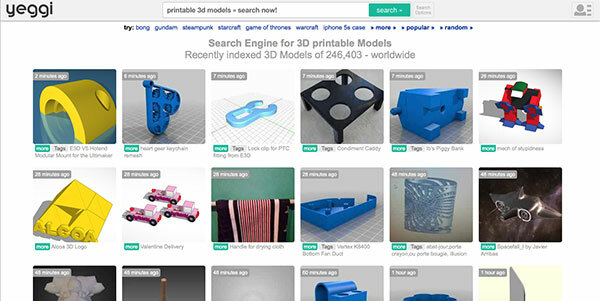 These websites provide STL models, which are recognized by all 3D printers. Some, 3D printers can read other formats such as OBJ and 3DS. 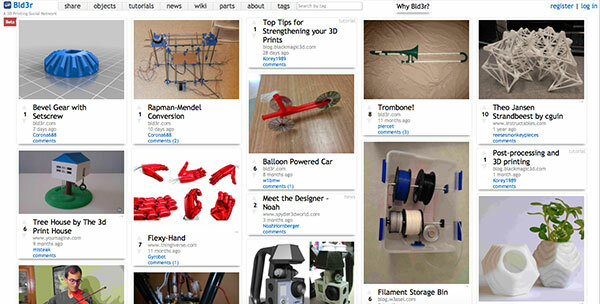 The list below includes top websites that you can visit to download free 3D printing models. Some of these websites are focusing on the engineering-related models and others are general purpose models that any designer can use. Thingiverse is part of the MakerBot website and it is one of the oldest websites that provides 3D printing models that can be downloaded in STL format. The website depends on a very large community who upload STL models that are 3D printing-friendly. Youmagine is run by the open-source 3D printer Ultimaker. Although it is new, it has number of useful 3D printing models and content. It does not have the number of users comparing with Thingiverse. Cubify is one of the well-known 3D printers and it is marked by its affordable price. This community includes STL models based on different categories such as kids, fashion….etc. Myminifactory is another 3D models inventory that is managed by iMakr, an online store to sell 3D printers and accessories. The advantage of using Myminifactory is that all the models are tested for quality and edit supports for the customization for models. 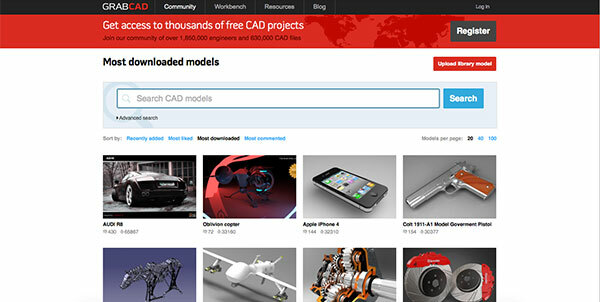 GrabCAD is a community of many designers and engineers whom share their 3D models. Registration is required to download the files. 123D is an Autodesk application that creates 3D models. The website provides a large number of STL models that can be used with any 3D printers. Cube Hero is a simple 3D community platform. While it does not have a great number of models yet it supports modeling request, where the users can ask for specific model to be made. Bld3r is another platform that provide free 3D printing models. The difference in this website, is that it provides a rating system, which identifies the best models. This system can help as quality control as one can identify the high quality models. Shapeways is one of the pioneer companies in the industry of online 3D printing. Users upload their models and the company 3D prints them and sends back to the user’s address. Furthermore, it includes a STL models community where you can download free models for 3D printing. Cults 3D is a French social network for designers where they can follow each other and build a community that is based on sharing 3D printing models. The website is in the English language and the 3D models are categorized based on their type. Pinshape is a Pinterest company and allows users to share 3D models in different formats including STL files. It works in a similar way to the main Pinterest website. Repables is a very simple website for free 3D models. It only allows users to upload 3D models so other visitors can download it. The website focuses on engineering-related models. Fabribles is another website that focus on engineering-related models. Its advantage is that it includes 3D models for RepRap 3D printers such as Delta printers. So, it can be used to find accessories and repair parts for the 3D printer. Fabster is a unique 3D printing models platform because it focuses on artistic and jewelry 3D models. Unlike the other platforms, this website includes a large number of jewelry 3D models that can be download and customized for 3D printing. Yeggi is a platform for users to upload and download 3D printing models in addition to search for a large variety of available models. The above websites can help users to find the 3D printing models that meet with their needs and print them using their desktop printers. Most of the models are designed for plastic filament FDM 3D printers. So, it is compatible with many of the affordable 3D printers. Having a list of these website broaden the chances to find STL models. Furthermore, the users can download the models and customize them in any 3D printing software. It could be great to have it included!